Well hello there! Today is a tiny victory, because we had the water marbling prompt, which I had never tried before, and I think it turned out alright for a first time. I decided not to do my entire hand, because I wasn't sure I'd be able to pull this off, and also, I'm too busy to be doing this. Lemme just try one. Start slow. I did just the accent nail, and I'm pretty happy with the result. I didn't really choose the color scheme so much as these were the only three polishes I had that I knew for sure would work since I did a lot of research as to how to do this. I love how they look together. They reminded me of cheerful, fun circus kind of colors. Don't ask me why. Anyway, after watching video after video, I found this one really helpful for a first timer like me. You might want t check it out. Sally Hansen - Jazzy Jade for base color of all but accent nail. 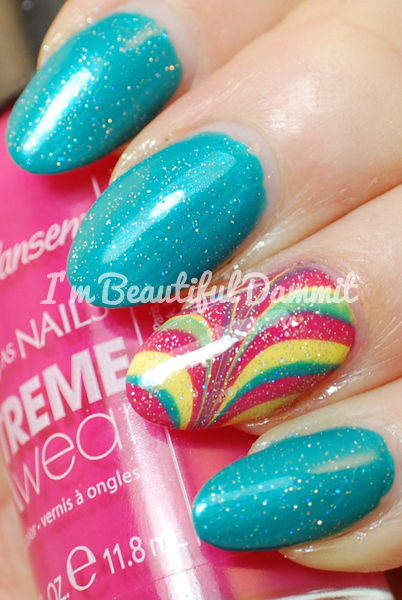 Sally Hansen - Tag Ur It for accent nail base. INM - Northern Lights for holographic microglitter top coat.